No recap this weekend? No problem! With the seemingly endless stream of awful coming from new Miami All-Access partner NeuLion, and the lack of a video stream of last weekend’s games, the point of doing a recap of each game was moot. None of the Warriors really got a chance to even listen to Miami’s radio voice, Greg Waddell, call the games because the damn feed was in and out of service every few minutes. And, for much of the time, it was out for several minutes at a time. That said, you may have heard that then #3 Miami split its two-game set at then #6 Michigan losing 4-2 Friday and winning 4-3 Saturday. Miami freshman netminder Jay Williams was the hero of the weekend as he stopped 30 shots in a losing effort Friday after coming in cold off the bench as starter Ryan McKay was forced to leave the game early after apparently injuring his leg or groin muscle. 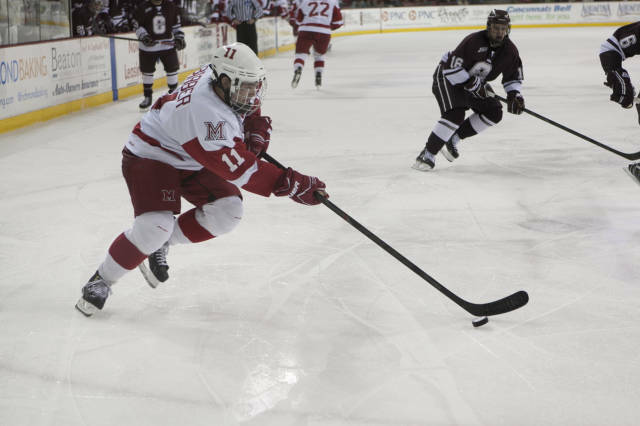 And, on Saturday, Williams’ 37 save effort propelled Miami to a 4-3 victory as the RedHawks scored three times in the third period to overcome a 2-1 deficit. Both games were played at breakneck speed with Miami and Michigan registering in excess of 65 shots on goal each night and were tightly contested. On Friday, the teams were tied 2-2 after two periods as the Wolverines capitalized on two quick goals in the third to register the 4-2 victory. And, on Saturday, Michigan led 2-1 after two, but saw the RedHawks score three goals in just 2:41 as they held on to earn the split, 4-3. Offensively, Miami was led by the tandem of Austin Czarnik and Riley Barber as they combined for six points on the weekend while Williams ran his collegiate record to 3-1. Following their stellar effort, Miami finds themselves ranked fourth in the nation in both major polls and in a six-way tie for third place in the CCHA, just a point back of second place duhOSU and three points behind Notre Dame. This week, Miami is on the road again at national runners-up and #19th ranked Ferris State in Big Rapids, Mich.
Last weekend, the Bulldogs split a home series with Alaska winning 6-3 on Friday before dropping the Saturday finale 3-2. Sophomore goaltender C.J. Motte was in net for both games making 76 saves on the weekend, the most for a Bulldog goaltender in a two-game weekend set since 1992. If that means anything, it could indicate the Bulldogs defense-first, trapping system isn’t properly functioning yet with the defensive departures of team captain Chad Billins, Brett Wysopal and Aaron Schmit. The Bulldogs are breaking in three freshmen defensemen, Simon Denis, Jason Binkley and Travis White, and you’d like to think the RedHawks can take advantage of their youth as teams have tried to do to Miami over the season’s first month. We’ll have a full preview later this week, but the teams square off at 7:05pm both night. Hopefully, Miami All-Access and Greg Waddell have the call if NeuLion can get its act together. Earlier this week, Miami announced the official results of balloting for the All-80s team and I have to say, somebody better explain how Craig Fisher, who scored 108 points IN ONLY TWO SEASONS against a true CCHA schedule, wasn’t part of it. 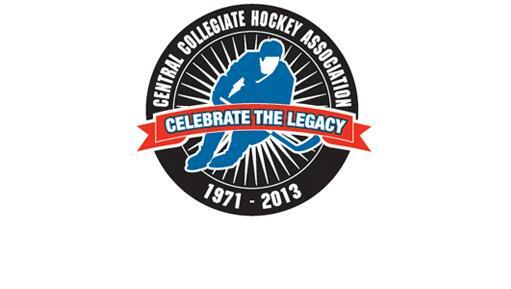 No offense to the guys on the team, but most of them rung up unbelievable numbers prior to the CCHA really coming together as a conference in the mid to late 80s. Michigan and Michigan State were not the powers in the early part of the decade they would become and Fisher faced those schools plus juggernaut Lake Superior State on some very underwhelming Miami squads that didn’t have a lot of talent. To be fair, Bowling Green was a very good program in the early 80s, but the CCHA simply was not the league it would become when Fisher was scoring 37 goals in 1989-90.
Who do you think was snubbed from this team? Balloting begins for Miami’s All-90s team on Tuesday, October 30 at MURedHawks.com. Freshman netminder Ryan McKay made 37 saves and classmate Riley Barber scored his second goal of the season as Miami fought to a 1-1 draw with visiting Providence on Friday night. As freshman goaltender Jay Williams has put it, “Miami is goaltending nation.” Or, something like that. In a highly competitive, somewhat chippy and certainly entertaining college hockey game last night, Miami’s other touted freshman goaltender, Ryan McKay, again put his substantial talents on display as he made a career-best 37 saves helping the RedHawks salvage a 1-1 tie against Providence of Hockey East. McKay, who has now allowed just one goal in his first 125 minutes of collegiate play, made several outstanding saves and was beaten just once on a 5×3 Providence powerplay as Miami has now successfully killed 15 of the first 16 opponents powerplay opportunities in 2012. This game, that more appeared more like a conference tilt but featured just 8 powerplay situations and 10 man advantages overall, was closely fought and the competitive nature of the game made it feel more like a mid-season clash rather than the third game of the season for both squads. Second-year coach Nate Leaman’s Friars carried the play through the opening period and at one point led the shots on goal category 14-3. However, Miami began to tilt the ice back in the RedHawks favor in the second and seemed to carry most of the play during the third. Seeing Providence and Miami play in last season’s Denver Cup, I thought Providence would be better than a 6-2 drubbing, and they showed last night they belong on the ice with the nation’s fourth ranked team. After allowing the first goal of the game for the second time already this year, Miami found itself down 1-0 after the first period. The RedHawks were outplayed and outshot 15-7 as the Friars came out hot early on the road in Oxford. Sophomore forward Ross Mauermann netted what would be the Friars only goal on the evening as he converted a rebound on the powerplay to give Providence the early lead. Miami would rally in the second period with the help of 10 more saves from McKay and a goal from classmate Riley Barber, his second of the season, off a feed from sophomore Austin Czarnik. Senior Curtis McKenzie, seeing his first action of the new year, added the secondary assist. It was certainly good to see #16 back out on the ice as this team can surely use his experience and grit, particularly as Providence tried to get physical with several smaller Miami forwards during the night. As Miami got back into the game, they also tightened up on the defensive end but saw Providence freshman Jon Gillies (perhaps the nation’s top goaltending recruit – he’s 6’5″ and just 18 years of age) make six saves on just seven RedHawk shots to keep the Friars even. In third and into overtime, both teams had outstanding chances but McKay and Gillies were flawless. McKay did get some help on a tremendous stop by Curtis McKenzie as he flung himself in front of a wrap around attempt late in the third that should have given the Friars the lead while McKay was out of position. Overall, this was a highly entertaining game with lots of end to end action. It will be interesting to see how Miami adjusts to the Providence pressure and what they do to get the big Friar goaltender moving side to side. Look for the RedHawks to let the puck do more of the work and I’d suspect a slower tempo tonight from Miami as I’d think they’d try to slow Providence in the neutral zone and make it more difficult for them to move the puck into the RedHawk end. Tonight’s series finale is at 7:05pm. Expect to see Jay Williams in net tonight for Miami. this weekend, as Providence comes to Oxford. The RedHawks are back in action tonight and tomorrow, as the Providence Friars come into Coach Cady Arena. After several months off that we thought we couldn’t endure, we finally have hockey back. I don’t know about y’all, but to me it seemed like it was another couple of months since Miami’s sweep of undermanned Colgate just last weekend. Or maybe it’s just that I haven’t been inside The Goggin since the end of last season, but it feels like FOREVER since I’ve made the trek from Columbus to Oxford to see the RedHawks in action. This week, the Friars come in after a split last weekend against two very different foes. In their season opener at home, Mark Jankowski and sophomore Stefan Demopoulos each scored two goals to lead this young squad to an 8-2 victory over Sacred Heart. Saturday, however, was a very different story, and Boston University took the Friars behind their barn and came out with a 4-2 whipping. Ross Mauermann is Providence’s leading returning point scorer (10G, 15A as a freshman last season), and the RedHawks will also be shadowing Junior Derek Army and Senior Captain Tim Schaller this weekend, as both were among the Friars top 5 scorers last season. The Friars will be led by the freshman Jankowski, who was chosen by Calgary with the 21st pick in the NHL draft last April. Jon Gilles was picked 75th in the same draft, and will be in net for at least one of the 2 games this weekend. Last week, he was named Hockey East Co-Defensive Player of the Week after posting a .936 save percentage while he stopped 14 shots against Sacred Heart (in 2 periods) and 30 of 34 shots against BU. Several RedHawks will be seeing Gilles again, as they were teammates with the Indiana Ice over the last few years. John Doherty, Max Cook and Blake Coleman were all teammates of Gilles. On the RedHawks side of things, Alex Wideman will not be appearing this weekend due to illness. As we reported on our twitter feed, Alex has been battling mono and will be out at least a couple weeks. Other than that, the RedHawks remain healthy. Don’t forget that 11 of the 26 RedHawks are Freshmen, and 3rd string goalie Anthony Jacaruso is also a rookie, although he has sophomore eligibility. Not to worry, however. 12 of the 21 points scored last weekend were from the super sophomore class (including 4 points from Blake Coleman), and 4 of the 13 total new faces appeared on the score sheet including Senior transfer Marc Hagel. Only 2 freshmen didn’t see action last weekend, and with Wideman out, we could see John Doherty see his first action this weekend. With all of the goal scoring leaving Oxford last season, Coach Blasi will need players like Coleman, Austin Czarnik and Jimmy Mullin to continue their progress and provide a much needed scoring touch. Save for maybe Bryon Paulazzo, the 8 upper classmen on the roster aren’t exactly known for their scoring touch, and Blasi will need more production from the new kids on the block. In net, expect to see the “new” rotation of Ryan McKay (1-0-0, 1 shutout, 24 saves) and Jay Williams (1-0-0, .952 save percentage, 1.00 GAA) split the weekend once again until a clear front-runner emerges, if ever. Both goalies looked more than capable in last weekend’s sweep, and it will certainly be a fun few years in Oxford if they continue to play like they did last night. McKay recorded his first career shutout in his first start in Oxford, and also earned Miami’s first ever season-opening shutout as well. Right from the start, these two have put Connor Knapp, Cody Reichard and David Burleigh on notice that their old records are already in jeopardy with these 2 highly touted recruits tending the twine. This week will pale in comparison to what we can expect next weekend, as Miami travels to #5 Michigan to take on Red Berenson’s hacks crew of misfits Wolverines. Miami must continue its strong special teams play – 13 for 13 on the penalty kill is 2nd in the nation, and 3 for 10 on the power play is also a very strong start. They must still apply pressure on a physical Providence team and this weekend will be a success. Look for 2 tough grind-it-out type of victories: I’m predicting a solid “Paula Weston” finish for the weekend: 3-1 and 3-1 Miami. Friday’s contest is a white out. For those of you joining me in Oxford, be sure to wear white to the game. Go RedHawks! The Miami Athletic Department has selected 17 individuals to find a new Athletic Director, the University announced today. You can click here to read the full release. First of all, Enrico Blasi is a member of the search committee. Phew. Doesn’t look like he’ll be pulling a Jerry York and taking on the AD role as well as the head coaching position. Not that we thought he would, but this will ensure he’s involved with the decision, and we will likely get someone that is, at least partly, committed to the hockey program. Excluded from the committee is Steve Cady. Currently, Coach Cady is labeled as Senior Associate Athletic Director, which in our books, means he was the Number 2 guy behind Bates. I’m reading through the lines here, but this likely means Coach Cady has applied for the position and/or is a (leading?) candidate. Also excluded from the committee is Head Football Coach Don Treadwell and Head Men’s Basketball Coach John Cooper. I wouldn’t go as far as saying this will be a bad thing for these 2 sports when it comes to the new AD, but it is interesting that neither of them are on the committee. With these as the 2 main revenue sports at Miami, a renewed focus on them will be sorely needed to bring the programs back to the top of the MAC, and back into the NCAA spotlight. Senior Defensive Lineman Austin Brown is a studen-athlete representative of the football program, as is Rick Amos, a football Alumnus from the class of 1987. Senior Defensive Lineman and Captain Austin Brown is one of 2 student-athlete representatives on the committee, as is Rick Amos, a class of 1987 Football Alumnus. Frankly, I’m shocked we don’t see Head Women’s Basketball Coach Maria Fantanarosa on the committee. Maria has been in Oxford as the head coach of the Lady RedHawks since the 1998-99 season (starting her 15th season), and graduated from Miami with a degree in speech communication in 1990. She has been a RedHawk for life and it surprises me that she is not a part of this group appointed by University President David Hodge. We’ll see what the committee comes up with in the coming weeks and months as the RedHawks hockey program roars into their CCHA schedule. Featuring players and video from this season, Miami has created and released its “You Can Play” submission which is simply amazing. As you recall, You Can Play was founded after the tragic death of Miami student manager, Brendan Burke, who’s father, Brian, is the current GM of the Toronto Maple Leafs. Brendan’s brother, Patrick, a Philadelphia Flyers’ scout, has taken up the torch to push YCP’s agenda forward. The vision of creating a locker room devoid of prejudice and hatred of LGBT athletes is something everyone should get behind, and the work the group has done to further that cause in the aftermath of Brian’s death, is amazing. So, here’s Miami’s entry. I think it’s perhaps the best one done to date. What do you think? Find out more about You Can Play and ways in which you can help.